This rare, circa 1904 47.5mm. Le Parc pocket watch is very fine, extremely thin (only 9mm. including the crystal) in a solid 18k. gold enamel hunter case with an elaborately blue guilloched enamel pattern (minor wear). The original dial is guilloche engraved and has blued steel spade original hands with Arabic numerals. The movement is very fine, decorated-just cleaned and accurate. I must stress, this watch is extremely flat, attractive and eye-catching. 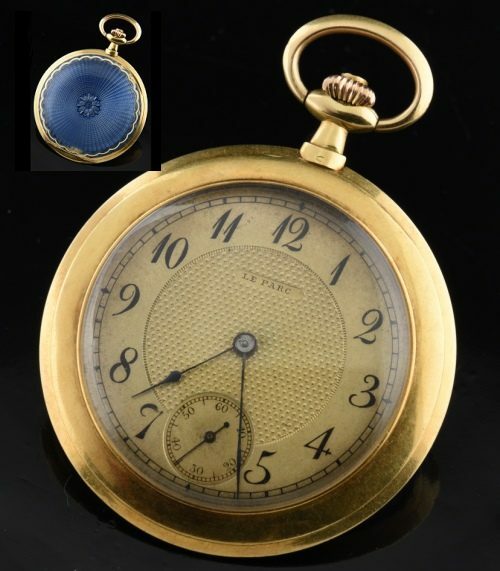 We’ve priced this SWISS pocket watch extremely well.